Merced, California is 80 miles from Yosemite National Park, but that was not far enough for Applicant Spirits of New Merced to avoid the Board's ruling that the mark YOSEMITE BEER is primarily geographically descriptive for alcoholic beer [BEER disclaimed]. The Board therefore affirmed the PTO's refusal to register under Section 2(e)(2). In re Spirits of New Merced, LLC, 85USPQ2d 1614 (TTAB 2007) [precedential]. For a mark to be deemed primarily geographically descriptive, the PTO must show that (1) the mark's primary significance is a generally known geographic location, and (2) the public would likely believe that the goods originate from that location. When the goods do indeed come from the location named, then a goods/place association may be presumed. Applicant's beer is produced and sold in its brewpub in Merced. 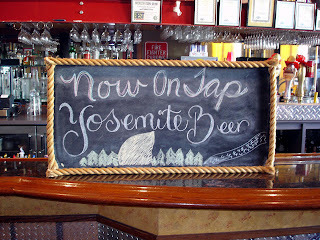 Examining Attorney Lydia M. Belzer maintained that "Yosemite" is a generally known place, that Applicant's beer originates "in the Yosemite region," and that there is a goods/place association in view of Merced's proximity to the national park. As to the first prong of the test, there was no real dispute that Yosemite National Park is the name of a well-known location. Moreover, the evidence showed that "Yosemite" is a "well recognized and frequently used shorthand reference" to the park. The Board found "no genuine issue that the primary significance of 'Yosemite' is a geographic place which is not obscure or remote but rather is generally known to the public." Applicant Spirits feebly argued that the word "Yosemite" has another meaning: it means "those who kill" or "the killers" in the Native American Miwok tribal language. The Board was unpersuaded, noting that even if the general public were aware of this meaning, "it would not detract from the primary meaning of 'Yosemite' as denoting a well-known geographic region." Applicant also pointed to various third-party registrations for marks including the word "Yosemite," and particularly to two now-cancelled registrations for YOSEMITE BEER and YOSEMITE BREWING COMPANY, both for beer, owned by a company that was only 40 miles from the park. So what? said the Board. The TTAB is not bound by a previous examining attorney's determination. As to the remaining registrations, they too were tossed aside by the Board, because each case must be decided on the particular record involved. Turning to the goods/place association, the question was whether Applicant's beer originates in the geographic location known as Yosemite. Applicant shot itself in the foot by asserting during prosecution that Merced, "where the beer is brewed, is physically and historically linked to and associated with the nearby Yosemite National Park." Applicant supplied promotional material for the city of Merced, which touted Merced as the "Gateway to Yosemite." "It appears from the maps and other information of record that the area surrounding Merced and the park is largely rural, and that Highway 140, which leads out of Merced, is one of the few roadways providing direct access to the park, and possibly the only access at certain times of the year. As stated in Merced's Chamber of Commerce brochure, it is 'the only highway not closed by most winter snowstorms.'" Applicant, of course, argued that its beer is not brewed in the park but rather in Merced, and it pointed out that the city does not use water that comes from the park. Nonetheless, the Board observed that "Yosemite has a significant relationship to the source of applicant's goods," and "Applicant is obviously using the term YOSEMITE ... not in any arbitrary sense as applicant claims, but rather to reflect its association with the geographic place." The Board consequently found that "the goods come from Yosemite ... or at a minimum that the goods originate in an area which applicant admits and the evidence shows is located near Yosemite." Since the goods originate "at or near the place named," the Board may presume an association of the beer with the park. Nothing more need be shown by the Examining Attorney to establish the goods/place association. Applicant attacked that presumption by arguing that no commercial activity takes place in Yosemite National Park, and therefore that there can be no reasonable or likely goods/place association. Unfortunately for Applicant, it was wrong on the facts. The Examining Attorney pointed out that there indeed is commercial activity within the park, including lodging, food, and beverages. "The facts that there are restaurants serving beverages in Yosemite and that applicant is located in or nearby the Yosemite region and promotes an association with Yosemite, establish a goods/place association of beer with Yosemite. Consumers would likely believe that applicant's beer had its origin or was in some way connected to Yosemite." Concluding that "'Yosemite' is a term that applicant's competitors in Merced are entitled to use to describe the geographic origin of their beer," the Board affirmed the Section 2(e)(2) refusal to register.